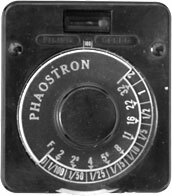 According to Phaostron's website (they're still in business), they began by making exposure meters and eventually branched into other electrical equipment. Phaostron made three models, all similar. This appears to be the little brother of the three. It's identical to the "A" model except that the calculator dial here reads in full stops, whereas the "A" goes down to third-stops; the "C" model does that and it has a much longer range, plus it reads in footcandles and it has a low-light circuit. But you need sharp eyesight or a good prescription to read the dial. This Model B is by far the easiest to read and use. This is a comparometer, which puts it in rare company with the SEI Photometer and Corfield Lumimeter: there's a window in the top center; the left side looks through the meter at the area you wish to meter; the right side shows a lamp. You hold this thing in you left hand with your thumb on the button on the bottom, and aim the meter at what you want to meter. While pressing the button, you turn the dial with your right hand until the brightness of the lamp on the right side matches the brightness of the ambient light in the window.on the left; the brightness knob turns the calculator dial, so that tells you the exposure to use.